Traditional cage bird diets have protein levels between 8% and 12%, rather than the 20% provided by those wild diets during the lush breeding season. These are too low for either good adult breeding stimulation or maximum chick growth. 8% protein is what you typically find in a dry seed diet. A seed based diet would normally provide enough protein for adult birds but their rapidly growing babies need far more to build skin, muscles, feathers and all the other key organs in their bodies. The adults naturally understand this so won’t try to breed when the protein level of the diet is inadequate. Sometimes they will start to breed as the day length becomes longer because that predicts that the food quality will improve. If it doesn’t they may abandon a nest of otherwise healthy babies. The first is to add limiting amino acids to the diet. Plant protein is different to the protein form found in animals, so adding these ‘limiting amino acids’ helps your birds to gain more value from the small amounts of plant protein they will get from their dry seed. Without these extras your bird can only use about 60% of the protein it gets from a plant source. 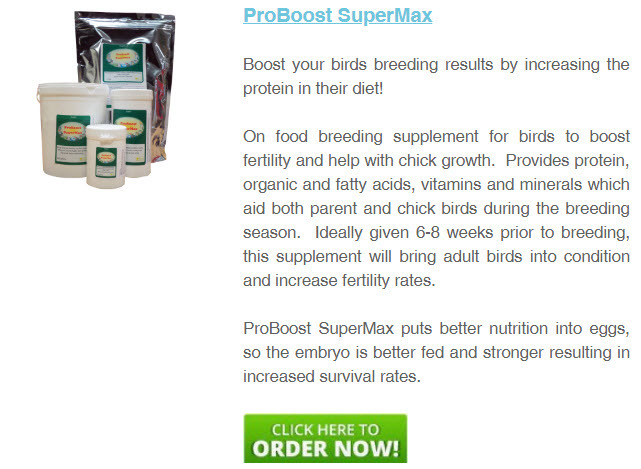 From a practical perspective, we have found that the protein levels of bird diets are not raised sufficiently through this means to bring top breeding condition, fertility and good breeding results. The second method which we recommend is to add a relatively small amount of a high protein mix the birds will enjoy, which is also derived from animal protein, so that their bodies can use it fully. If you think about it, many birds boost their diets with animal proteins – look at blackbirds and worms; swallows and insects; the list is endless. All those birds have adaptations to enable them to catch, kill and consume the prey available in their native territory and many seed eaters become insect eaters when they have chicks.